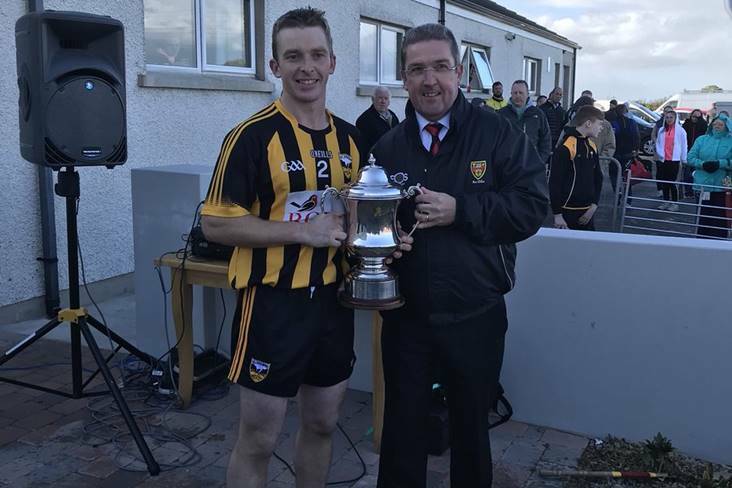 Ballycran captain Micheal Hughes accepts the Jeremiah McVeigh Cup (Down SHC). Pic via Official Down GAA on Twitter. Ballycran joint manager Michael Braniff believes his charges are in a bullish mood ahead of Sunday's Ulster club SHC final. The Down champions are 4/1 outsiders to lift their first provincial title since 1993 as they prepare to face strong favourites Cushendall of Antrim. However, Braniff told the Down Recorder that they are full of confidence having defeated defending champions Slaughtneil in the semi-final. "To beat Slaughtneil, who were worthy champions, has to give you momentum," said Braniff. "We hurled well against Slaughtneil. We didn't let them hurl. "We're confident in our own ability. We know what we're at and we've played this game for a while. But Cushendall are a good, hardened club side with some great skilful players and a blend of young and old so I think it's going to be a fabulous occasion on Sunday and it could go either way."